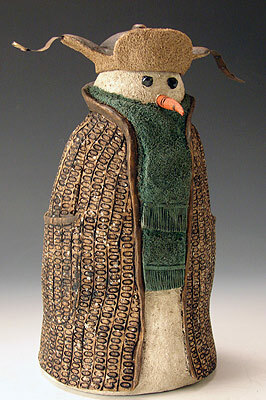 Texture and detail gives this snowman the "coolest" look for the season! Sporting a leather trim tweed coat and knit scarf he's ready for any kind of weather and to top it off he's wearing an aviator style hat. The hat actually looks like distressed leather with lambswool flaps and leather straps to secure it in harsh winter weather. Hand carved entirely from American chestnut.